Silke Helfrich Explains the Origins of "Patterns of Commoning"
The following is an interview that Silke Helfrich gave to Michel Bauwens about the assembling and editing of the anthology Patterns of Commoning, which has recently been posted online at Patternsofcommoning.org. In coming weeks, I will be posting selected chapters from the book here. Bauwens: Silke, could you first give some background about yourself and your collaboration with David Bollier in editing your books about the commons? 1. As collective resources, both material and immaterial, which need protection and require a lot of knowledge and know-how; 2. As social processes that foster and deepen thriving relationships; and 3. As a new mode of production that I call the Commons-Creating Peer Economy, or Commons-Oriented Economy. I’d even say that there is a fourth level: the Commons as a worldview, as the expression of an ongoing paradigm shift now underway. B: Is Patterns of Commoning an effort to sow seeds that will make the commons visible? H: Absolutely! 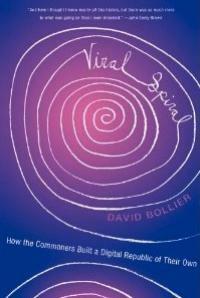 It is the second of three books that explore different aspects of the commons. The first began in 2010, when together with David and almost 80 contributors from all over the world, and thanks to the tremendous support of the Heinrich Böll Foundation, we started to work on an anthology called The Wealth of the Commons. That book was originally planed to sketch out the philosophical and policy foundations for a commons-friendly politics. But we quickly realized that we first had to introduce the commons and explain why we believe that commons having very different practices and resources – so-called traditional commons of land and water, for example, and digital commons on the other hand – are in fact related. They may look very different based on the resources managed, but in essence they have a lot in common – a social commitment to manage the resources responsibly, fairly and in inclusive ways. The Wealth of the Commons became longer and longer, and so we ended up doing what commoners often do when there is an unsolvable conflict: we forked the project. David and I started thinking about a volume 2, which in 2015 became Patterns of Commoning, an anthology of profiles of successful commons and an exploration of the inner dimensions of commoning. Mid-way through this book, after maybe a dozen of concept versions of it, we realized that all good things come in threes, so we committed to a third volume, this one on the macro-political, economic and cultural dimensions of a commons-based society. Probe the inner dimensions and logics of commoning, including the subjectivities of commoners – the consciousness of how to think, learn and act as a commoner. (This is not an easy thing to do, either in theory or practice!) We also wanted to break down some of the dichotomies of thought that we take for granted, such as the binaries of public and private, collective and individual, rational and nonrational. In the commons, all of these categories start to blur and become a new category entirely (volume II). Embed the commons-world in a context of wider transition towards a society that is free, fair and sustainable. It is important to deal with these three dimensions together, as an integrated whole, because, for me, it defines the commons as a narrative. 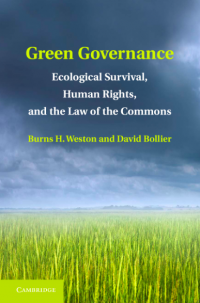 The commons approach is the only one I know of that connects environmental stewardship with claims for justice and the strengthening of freedom. In our next book (volume III), we want to show how we need to re-imagine public policies by taking account of our fuller humanity and capacities, and not just look to cardboard notions of human beings such as homo economicus or “consumer.” We hope to publish this new book by mid-2018. B: So do the three books on the commons build on one another? Did any “emergent lessons” from the first book influence the themes of the second book? H: Each book builds on the preceding one, and yet each also is a standalone work. The same is true for each of the contributions in the books – altogether, about 130 essays. You can read them separately, but you will also enjoy reading them as a collection. :¬-). Let me give you two examples: In The Wealth of the Commons, we focused on connecting commons that supposedly belong in different categories, such as “digital commons” and “urban commons” and “traditional commons,” etc. But we wanted to identify the many strategies of enclosures and show how people around the world are resisting them in self-organized ways. We also focused on some good practices that might inspire policy making. The German title for this volume was Commons. For a new Politics beyond Market and State. But the very moment I sent it to the printer it became crystal clear to me that this was and still is a pretty misleading title. It’s about culture, in the first place. Not about politics. And if we bring it down to politics, we would need to redefine what we mean by “politics” from a commons perspective and probably come up with a new concept. We have come to realize that you cannot describe the commons for the 21st century with some of the conventional words we use for economy and politics, which often have embedded, archaic meanings. We need to show how a new type of politics could be enacted instead of merely suggesting good ways to foster the commons via outdated political institutions, legal processes and policies. So, when you write about the commons, you write about a deep cultural transformation. This first volume should have been named Commons: For a New Culture… , or something similar. That was not entirely clear to us by the time. So we went on with our explorations of commoning, and in volume two, we began to develop a deeper understanding of the commons-world. We began to see that many of the epistemological categories for talking about commons are too limited. For example, every commons, also ones that revolve around land or water, are knowledge commons, because the commoners must learn and apply knowledge in managing them. And all “knowledge commons,” even ones based on digital systems and intangible creativity, are based on natural resources – the minerals needed for the computers, the electricity generated from fossil fuels, and so forth. The common denominator among commons is that each one is first and foremost a social commons – a social process. We also started to wonder to what extent a commons-creating world builds on different core-beliefs? In several essays, prestigious anthropologists from different continents helped us dealing with this issue. B: But this doesn’t explain the title, Patterns of Commoning. Is it in any way related to the pattern language model originally developed by the architect and philosopher Christopher Alexander? Both framings are very very helpful, but they don’t address many of the subjective, social and personal dynamics within commons-based institutions. Is there a inner logic woven through human interaction that holds a commons together? And if so, what can we learn from it? How can we assess and describe it without seeing commons as panaceas? 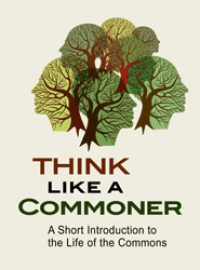 I think, that formulating a more fully developed “pattern language of commoning” – something that is yet to be done – can help people become more conscious about the “commoner within me.” Hence the title Patterns of Commoning. Such patterns will help us to make commoning easier as we apply them to overcome problematic situations that occur over and over again. B: What do you mean by “pattern”? H: A pattern is a kind of “reusable problem-solution-core-idea.” Alexander puts it that way: “…a pattern describes the core of the solution to that [a] problem [that occurs over and over again], in such a way that you can use this solution a million times over, without ever doing it the same way twice.” That fits very well to the commons approach, because each commons is one of a kind. Each commons is unique. If you connect many of such patterns, you weave a so-called “pattern language.” Hundreds of pattern languages already exist for specific fields of design such as software programming, education and transition economies. They are like mental toolboxes. “Who is in and who out?”, which points to the problem of exclusion – a topic of growing importance in the wake of global migration. “Who takes the decisions and what are the principles of decision making?” Majority vote? Certainly not. It leaves too many people behind. “How to make sure that everybody who is affected by a commons is involved in the decision making process?” This is one of the key claims we find in the commons. It is a radical democratizing approach! But how to put it into practice? Patterns help us to avoid reinventing the wheel over and over again without insisting upon rigid, standardized “models” or “recipes.” The bad news for us is: that’s precisely what politicians and journalists want to impose. They assume that legislatures and bureaucracies must mandate universal, one-size-fits-all, top-down policies that will “fix” a problem. But patterns are just this – patterns. If you really want to use the commons as a problem solving tool, you need to identify the underlying pattern of commoning, get involved with it as a practitioner and adapt it to your context. B: Does the patterns approach work with the newer digital commons? Did you notice any difference in those patterns as compared to the older “material commons”? H: Actually, the patterns approach is especially widespread in the digital commons world. Software programmers are used to working with design patterns. Take Wikipedia, which is unthinkable without its core pattern, the wiki. Ward Cunningham created the first wiki in 1995. His “WikiWikiWeb” lets software developers create a library of “software patterns,” which brought order into a highly complex, open and never-seen-before process. One can safely say that design patterns are an essential feature for design and making sense of the digital world, including digital commons. B: How was the book materially produced and distributed? I have heard that you experimented with a new model. H: Indeed, for the English version (the case of the German one is very different), we decided to bypass commercial publishers. 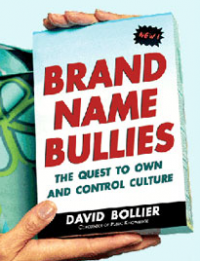 We realized that none of them would find our book commercially attractive – or if they did, they would want to assert too much control at too high of a price to us, the editors. There is simply no level playing field between most commercial publishers and authors. Publishers reject books like ours with arguments like: “It’s an anthology, and anthologies don’t sell.” “It’s too international in focus.” “Don’t you have any big-name contributors who are markable?” “What is the commons, anyway?” And so on. It became clear that the old-school business models used by publishers – even the politically progressive niche presses that share our values – were not prepared to engage into what we’d call: “publishing as a commons.” So we opted for a combination of self-financing and working with a workers’ printing cooperative in Amherst, Massachussetts. How did we produce an affordable, highly shareable 400-page book? By applying one of the most important patterns in the commons: Build community first! We have been working for years with scores of commoners activists, academics and networks of people. We’ve somehow built a global community. Now, we could rely on our international community of commoners! We did a private crowdfunding campaign to solicit advance bulk orders of the book — $10/copy in increments of ten. This raised enough money to finance about half of the cost of the print run of 2,000 copies. David and I personally paid for the rest of the print run, which we expect to recoup after selling a few hundred copies. With this plan, supported by commoners, we were able to reclaim control over what would happen with our book and avoid the constraints that conventional publishing business models usually entail – a high sales price, copyright restrictions that diminish access to the book, an inability to use a Creative Commons license, and even limits on content and the number of pages. On the other hand, by publishing through a commons-based model, we have had to deal personally with the distribution of the book. This is a tricky challenge, especially for a book with international appeal. But it has worked! We found a London-based distributor, Central Books to sell books to readers in the UK, Europe and the rest of the world. It is all built on the logic of commoning, however: First, build community (which took years of work), then support each other and share the benefits. B: How has the book been doing in terms of distribution and critical engagement? H: We have sold nearly half of our print run of 2,000 copies in the first year. 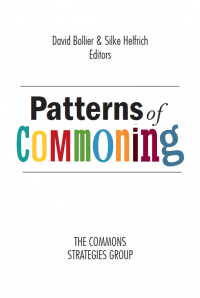 We recently put all of the book chapters online at http://www.patternsofcommoning. We have had a lot of publicity through commons networks, but less publicity through conventional marketing channels in the book trade. However, sales of the book continue steady – and we expect that posting the book on its website will spur greater visibility and interest in it. 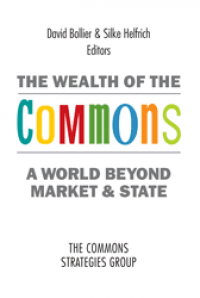 We put all of the chapters from The Wealth of the Commons online, and that website consistently gets more than 3,500 visits per month – four years after its publication! B: What are your plans for the future? In the context of your collaborations for the Commons Strategies Group (of which I am also a partner, in the interest of disclosure), how do you see the third and final (I presume) volume? What will be your focus when all the books in that series are completed? H: This next book will certainly be the final one (for the moment). But together with Commons Strategies Group, I will continue seeding new conversations and try to explore open outcomes. I personally want to focus on developing a pattern language of commoning while spending time in my 500-year-old house…and travel less! B: What do you see as the main weaknesses of the commons movement and how could they be overcome? H: Its lack of self-consciousness about its own activities, successes and unmet potential. It is something that we can overcome by turning the commons into a meme… slowly but persistently. Another weakness is the risk of being overrun and eclipsed by populist movements, which – if you look at them closely – recycle stale old stews of oversimplified answers. The commons offers fresh approaches. But its success will require wider attention and focused action.